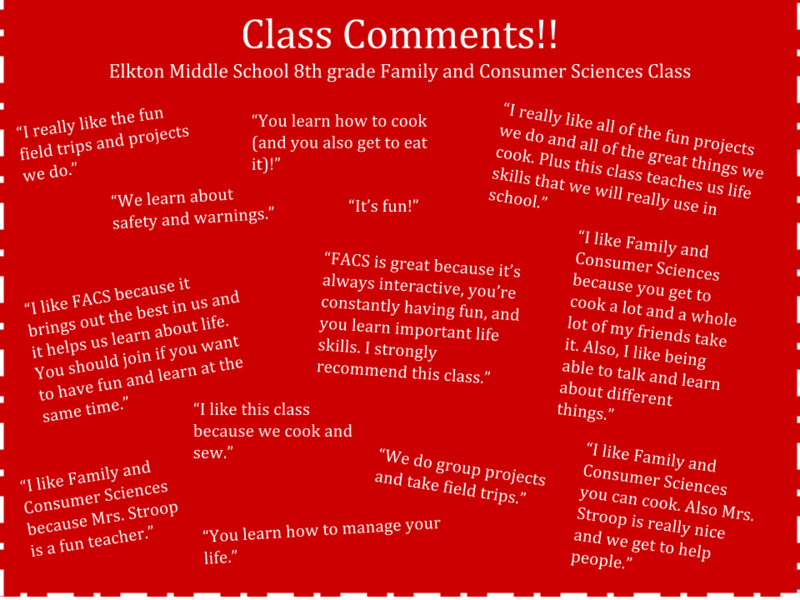 ​ FACS stands for Family and Consumer Sciences, which is an elective class at Elkton Middle School (EMS). This class is available to all students at EMS from sixth through eighth grade. Family, Career, and Community Leaders of America, FCCLA, is the co-curricular after school club with FACS. Family and Consumer Sciences is not the same thing as home economics. FACS is the new and improved version of home economics because it teaches many of the skills that help young people learn how to achieve their goals in life. Family is the central focus of FACS so students learn about the importance of family ties. Since FCCLA is a huge component of FACS, it will often be a topic of discussion. A student will complete projects throughout the course of FACS to improve oneself *(Power of 1), one's family, and one's community or local FCCLA chapter. Students learn how to properly cook and store foods to avoid contamination and foodborne illnesses. In addition, students enrolled in FACS will learn about housing and interior design. They will also learn how to operate sewing machines. Students learn how to manage time and money as well as how to eat and live a healthy lifestyle in Family and Consumer Sciences. Furthermore, this class also prepares students with the skills necessary to live successfully on their own by setting goals and planning their immediate and distant futures. Career readiness is another fabulous subject in this class that teaches students skills such as problem solving, oral and written communications, teamwork, leadership, and professionalism. Basically, in Family and Consumer Sciences, a student will form a plan and set goals for his/her future while obtaining skills that aid in having a successful life because we are the future.